With St Patricks Day coming up I like to make an Irish Soda Bread Recipe. 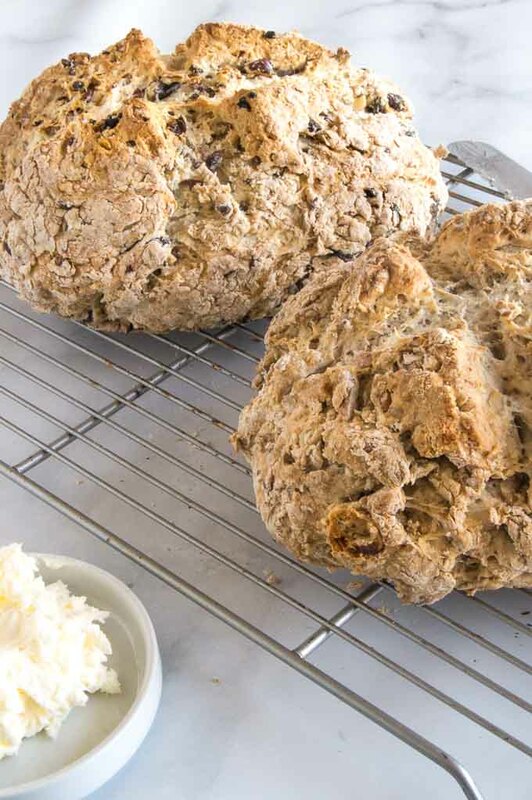 It can be made in no time and can easily adapt the soda bread recipe to make it just the way whoever Im making it for likes it. It makes a good loaf that is easily brought to put lucks, or as a gift for a neighbor. Each loaf when finished has a tender crumb inside with a slightly crunchy edge. It makes great sandwiches although it does tend to be very filling so we usually only use one slice when making a sandwich. Its best served right after cooling after baking. Butter is a nice topping, but its fine alone with no topping at all. 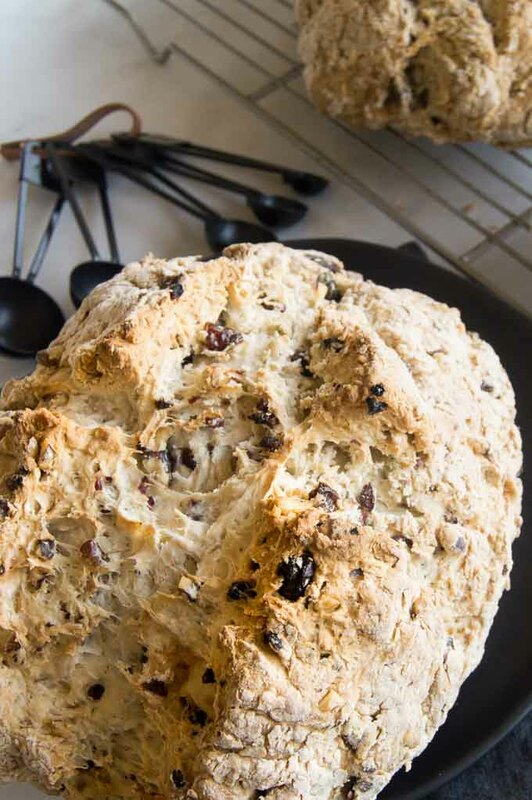 What is Traditional Irish Soda Bread? 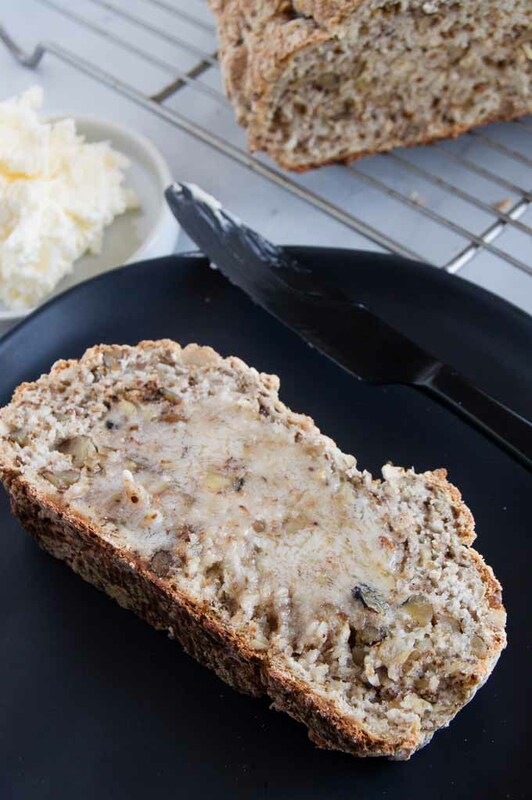 Irish soda bread is a simple bread made with just four ingredients. Buttermilk, flour, salt and baking soda. Soda bread came from Ireland and was born out of poverty. At the time it became popular because it had only four ingredients that were readily available and affordable. The flour available in Ireland was made from the crops grown there from wheat that made soft flours (think pastry and cake type flours and a lower gluten content.) Because of this flour soda bread only needed the soda to allow the bread rise. Historically there is a cross cut onto the top and some historical accounts say that this was done in Irish Monastary’s to have the loaf be blessed. 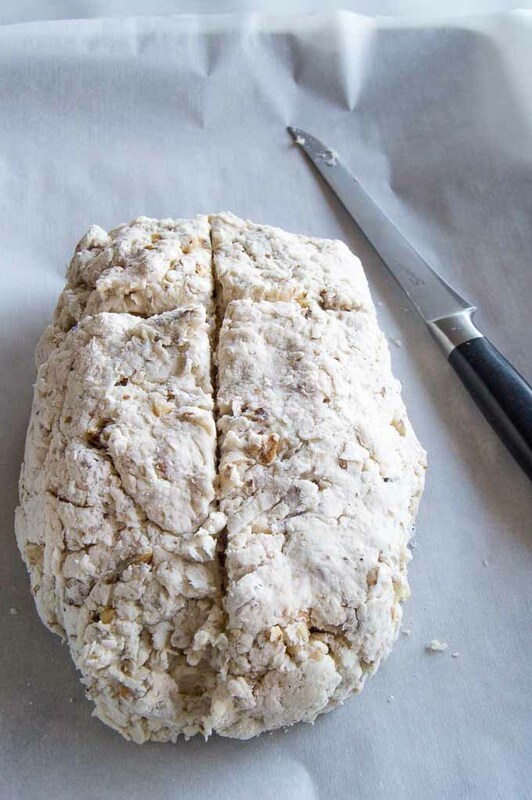 Making soda bread is very easy. There is no kneading you need only put the ingredients in a bowl and stir. When you are stirring it it will come together very quickly. You don’t want to ever work it or it will be tough so you will stir just until the dough is all wet and mixed together but not smooth and shiny. In the photo above you can see the dough is combined; its wet and no leftover flour is seen, but its still a little craggy not smooth and shiny in texture. At this point you can put it out on a floured surface and your hands will form it easily into a loaf. Once its in a loaf form you can place it on the sheet you’re baking on. You’ll need to cut an “X” or a cross into the top of the loaf. While history says this was for “blessing the bread” in actuality it is to allow the loaf to open up and expand easily and aids in making sure the center of the loaf bake completely an not have a raw center. All that is left at this point is to bake your loaf. I highly suggest you flip your pan at about half way through. This helps with even baking and accounts for any hot spots in your oven. You will also need to be very patient and allow the loaf to cool for a good half hour after removing it from the oven. The loaf continues to bake while it is resting. You dont want a raw piece when you get to the middle of the loaf. Do you have to use buttermilk? You can sub 1/2 cup yogurt and 1/2 cup milk for buttermilk. The flavor will be slightly different, but it wont be very noticeable. I haven’t tried it (but Im going to very soon and I’ll report back) but you can also use Irish stout. Any beer will work, its the yeast in the beer that you need to have to react with the soda in the bread to have it rise. How can you customize your soda bread? When customizing your loaf the possibilities are endless. You can also put in a mix of any of the above. The recipe included can withstand about 1 -1/2 cups of any add-in for each loaf. 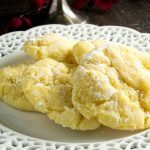 Looking for other easy recipes for giving to your neighbors or taking for a potluck! 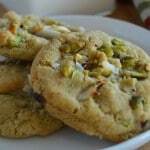 Madi from Mildly Meandering has some amazing Palmier Cookies here! Or be sure and check out these for Cranberry Orange Bread Tropical Cookies and Million Calorie bars! 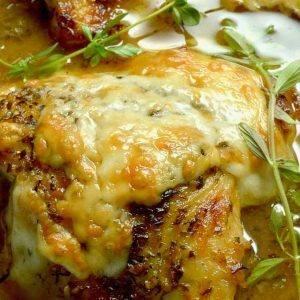 More Irish recipes you might enjoy! Mix together flour, baking soda and salt. Add buttermilk and stir vigorously until dough comes together. Dont over work it. The dough will be craggy. Meaning the flour is totally absorbed and the dough is wet, but it isnt shiny and stretchy. Add fruit, nuts, or whatever you wish to add in. 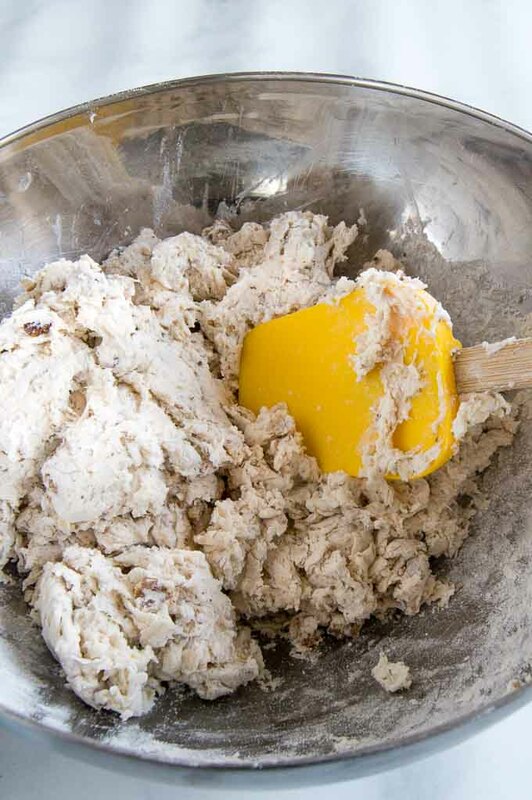 Turn dough out on a lightly floured bowl work surface and knead gently for one minute. Do not overwork. 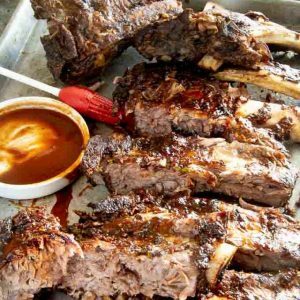 Pat dough into a disc and place on a greased sheet pan or a pan lined with parchment paper. Slash the top of the loaf to resemble a cross. Bake at 375° for about 50 minutes. Cover with foil for the first 20 minutes to prevent over browning. Flip pan once during baking to avoid any hotspots in your oven. Yum! This looks delicious! I’ve only had Irish soda bread a few times a long time ago, but I remember loving it. I can’t believe it’s so easy to make! 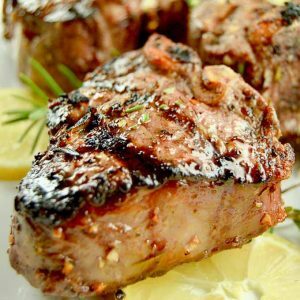 Unfortunately, I was diagnosed with a severe gluten allergy and can no longer enjoy recipes like this one. Do you think this would be possible to make with a gluten-free baking mix (like Bob Red Mill’s 1 to 1)? I might give it a try for St. Patrick’s Day! I’ll let you know how it turns out. Thanks for sharing! 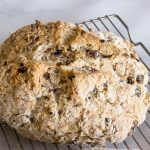 I’d been searching for the perfect Irish Soda Bread Recipe, and I found it right here on your lovely blog! This recipe turned out just as you described. My kitchen smelled fabulous as it was baking. I’m planning on making this yummy bread a second time for St. Patrick’s Day! OH that crackly crispy crust is calling my name!! I want to rip a piece off, spread it thickly with salted butter and munch away! I love soda bread! 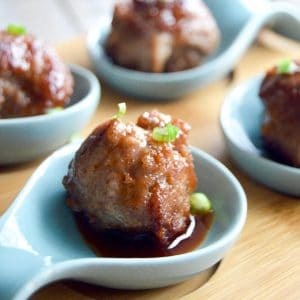 Such a simple recipe and so good. I’m pinning this to make it later!